When I got up this morning, my internet was out. After trying to revive it for an hour (and calling AT&T only to have them tell me the "line test is good" and keep asking me if my browser loads any pages when clearly my router can't even acquire an IP), I gave up and tried to do some work. Sometimes rebooting the DSL modem fixes the problem, so every thirty minutes, I'd do that. Finally, at around 1pm, I decided I couldn't wait around any longer and went out to run some errands. 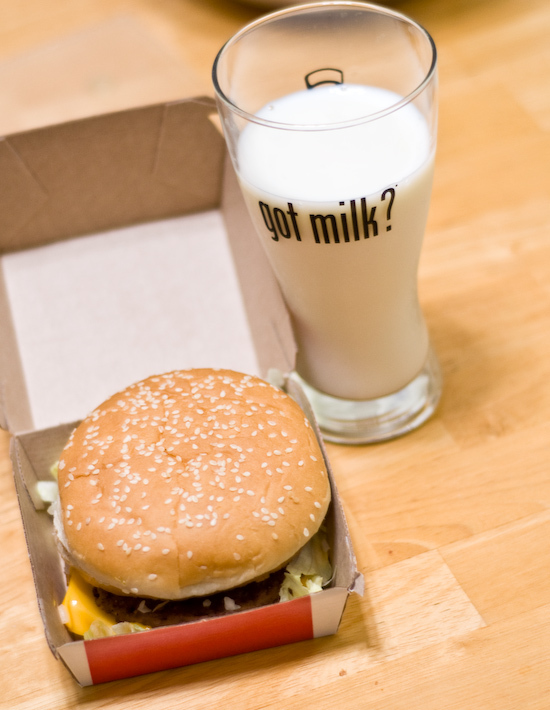 I grabbed some lunch on the way back: McDonald's Big Mac and a milk. Around dinnertime, I started preparing Salisbury steak for dinner (while calling AT&T again - they made me unhook the router and plug a machine directly into the DSL modem, I played along and did all the things they wanted me to do (what was the point if I wasn't getting an IP?!?) until the tech support guy ran out of things to try. Then the guy finally said "I'll send this on to the maintenance team. I had a note on my system that said at the start of the call to forward to maintenance, but I was hoping to fix this." I was a little exasperated. An hour later, the maintenance team calls and says there was an outage in my area that the customer support people didn't know about because they "just handle software issues" and then my internet came back.). The "steaks" were a little tough - I used pure ground beef. Next time, I'll spend a little extra time mixing in bread crumbs, diced onions, and a little egg to produce a softer more tender patty. 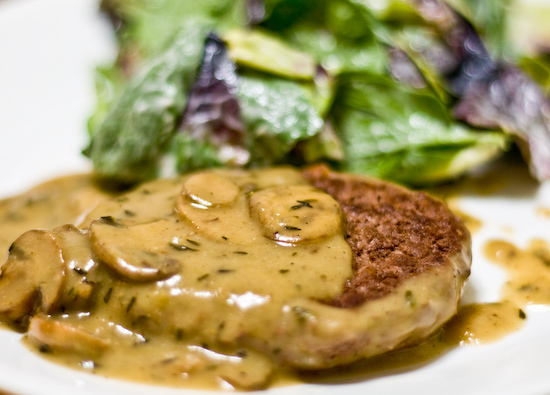 I prepped a gravy from the fond and added cooked mushrooms. Served with a butter lettuce & baby spinach salad and two slices of left over pizza from Crossroads Cafe (more like cheesy foccacia bread).